Difference between revisions of "Transportation Models"
The [[Introduction to Compartment Models]] describes how an infectious disease evolves in '''time'''. STEM also allows users to represent the geographic distribution of people (or animals) and how they move about in space. A compartment model that deals only with the trajectory of a disease in time implicitly assumes that the population (or populations) in question is so well mixed that there is no need to model the spatial distribution of people. However, for very large scale simulations, the details of population distribution, transportation, trade, even wild bird migration can all be important factors in understanding the evolution of an infectious disease in space and time. The following page describes how [[Transportation Models]] are implemented in STEM. As a convenience to users STEM implements a simple nearest neighbor mixing models for '''human''' populations based on the existing common border edges in the built in graphs in STEM. Common Border edges represent physical adjacency. The default mixing model can be dissabled by setting a mixing distance, &lamda; to zero. The default mixing model is described below. As a convenience to users STEM implements a simple nearest neighbor mixing models for '''human''' populations based on the existing common border edges in the built in graphs in STEM. Common Border edges represent physical adjacency. The default mixing model can be disabled by setting a mixing distance, &lamda; to zero. The default mixing model is described below. Please note, if a user defines ''any'' custom mixing edges within their graph, the default mixing model is '''not''' used and only the user defined mixing is invoked. The Introduction to Compartment Models describes how an infectious disease evolves in time. STEM also allows users to represent the geographic distribution of people (or animals) and how they move about in space. A compartment model that deals only with the trajectory of a disease in time implicitly assumes that the population (or populations) in question is so well mixed that there is no need to model the spatial distribution of people. However, for very large scale simulations, the details of population distribution, transportation, trade, even wild bird migration can all be important factors in understanding the evolution of an infectious disease in space and time. The following page describes how Transportation Models are implemented in STEM. As a convenience to users STEM implements a simple nearest neighbor mixing models for human populations based on the existing common border edges in the built in graphs in STEM. Common Border edges represent physical adjacency. The default mixing model can be disabled by setting a mixing distance, &lamda; to zero. The default mixing model is described below. Please note, if a user defines any custom mixing edges within their graph, the default mixing model is not used and only the user defined mixing is invoked. Road Transportation Edges are connections weighted by the number of roads connecting two regions. Air Transportation Edges represent transportation by Air Travel. Mixing Edges represent circulation of the population with each edge associated with a particular population by name. Today this is done with (bidirectional) Common Border Edges (and the computation simply assumes a human population). Migration Edges represent migration of people over time. With these directed edges, users can specify migration rates or create their own migration model. The STEM Common Border edge data sets now include the correct common border length, ℓij, for each edge and the approximation above will soon be implemented. The mixing edge graph generator creates the graph of mixing edges with a user-specified default value. Users are free to edit the (generated) .graph file and specify individual rates for each mixing edge. The advantage to a custom mixing model is its transparency (each edge lists its mixing rate). The disadvantage is that it is up to the user to define these rates or to implement an algorithm to set or reset them. IF a user graph contains ANY custom mixing edges, STEM will NOT iterate the default internal mixing model described above. Unlike population mixing which modifies the terms in a disease model computation, migration is a property of the population itself. The figure below shows a simple example with two locations, i & j , each containing a population of humans and a population of geese. Migration Edges are directed. 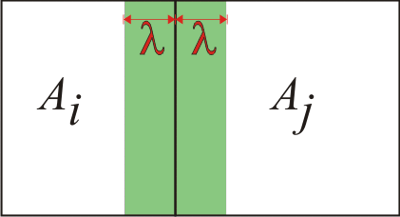 There is one edge for each direction of migration (i=>j and j=>i). Migration edges are also specific to the population type (humans or geese in this example) and, of course, they are labeled by a migration rate μ which represents the fraction of the population that moves from one site to another in a given time period (usually one day). 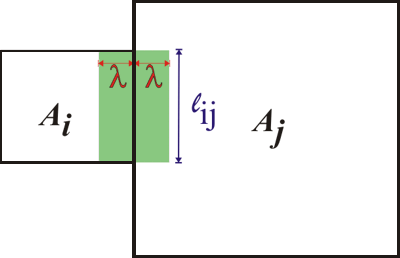 In general, μij≠μji. When they are not equal there is a net migration of the population form one node to the other. If the migration rates are equal then the populations are mixing (and user can consider using mixing edges for this purpose). Today STEM provides a tool to generate a graph of migration edges for an existing lattice graph. In the future new tools will be provided including a graphical editor to allow creation of specific edges and a function to import a graph from a user-defined file.